Skinny Budget: I LOVE PINK! 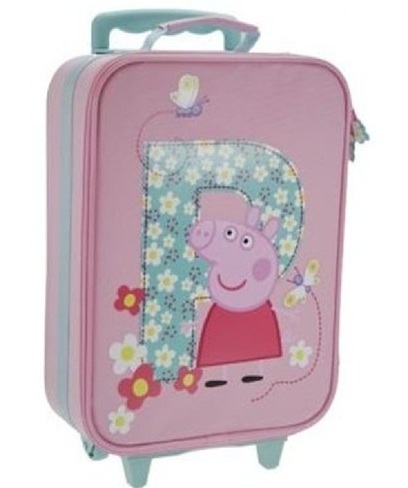 Unfortunately I don't have a very glamorous pink suitcase, in fact, mine is grey...and it generally looks exactly like about 4-5 other peoples suitcase when I go to collect it from the baggage area. I've often thought about wrapping a big piece of bright ribbon around the handle but...always forget that never seems to eventuate because I am too slack. 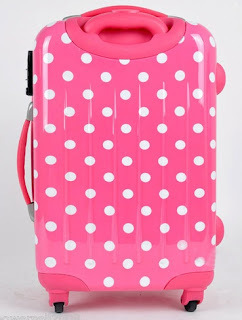 I always see the expensive brand name suitcases coming towards me at the baggage claim and think Ah, If only mine too where Guess but honestly...I don't think I could or would spend a fortune on a suitcase unless I was going overseas. The above and below images are more so a starting point of what I'd love for Lily and I. I have a..list in my head of what I need and want in travel luggage. The MAJOR contender would have to be roller wheels, not only is this a back saving edition to luggage but the convenience factor cannot be rivaled....unless you have a designated luggage carrier..you lucky thing you! 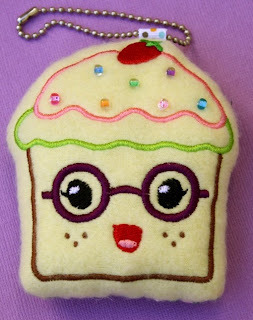 Maybe while I contemplate the benefits of making my luggage easier to see with bright ribbon or a humungous cupcake keyring (see below) I should also start making a list of things to pack in my all-too-grey-heavy-monster of a suitcase for my cousins wedding in less than 2 weeks. Week 20 Pregnancy Update: Half Way!! Week 19 Pregnancy Update & Gender Reveal!